It’s fast becoming the best restaurant row in San Diego County with one outstanding restaurant after another sitting side by side with each offering memorable cuisine from different counties. Plus, it’s freeway close to virtually every suburb in central San Diego. And getting there is easy. Freeway travelers along the I-5 freeway will be able t see it. as it is just north of the Old Town San Diego Historic Park. So it’s a quick exit from the freeway at the Washington Street exit and you’re there. The International Restaurant Row has been a popular place to grab a bit to eat for many years, but with the addition of the likes of Rubicon Deli, it’s stepped up a notch. Plus, it just recently changed is name from Middletown/Mission Hills to The International Restaurant Row. Interestingly enough, its former name dates back to the 1890’s, when its location was roughly halfway between historic Old Town San Diego and New Town, which is where the present downtown San Diego is today. And, interestingly enough, it has had many names over the years including Five Points because at the foot of the hill, five streets intersect at the foot of Washington Street. The latest naming of this area seems most appropriate as it now the home of many bustling international restaurants frequented by hundreds of hungry diners for both lunch and dinner. And if there is a reason why this rather non descript geographical area has became The San Diego International Restaurant Row in the first place is because a small tortilla factory opened there 75 years ago in 1940, and has grown in stature to become the famous El Indio Mexican Restaurant 75 years. From it’s humble beginnings as a tortilla factory it has grown into being one of San Diego’s most recommended restaurants. And believe it or not customers are willing to wait in line just to get into the restaurant. To get to The International Restaurant Row from the north take the Washington Street Exit and take a left at the Washington Street traffic signal. It’s two blocks up the hill on your right. If you are coming from the south from downtown take the Washington Street exit that empties out onto India Street, which is where the International Restaurant is located. You’ll see it on the right as you proceed north. There is lots of metered parking, and El Indio had a small parking lot of their own. You should most definitely begin your tour of the many restaurants comprising The International Restaurant Row with a visit to the world famous El Indio Mexican Restaurant (1) at 3695 India St. (619-299-0333). It’s not uncommon for out-of-towners arriving by air to have disembarked at the nearby San Diego International Airport and then beelined it to El Indio Mexican Restaurant to get their taste buds satisfied with a meal from El Indio. In fact, this is one of the few restaurants where diners willingly wait in line to order their meal at the counter. And once their name is called they pick it up and eat their meal on one of several patios or in the dining room. Having a meal at El Indio is definitely a San Diego tradition. As fate would have it, El Indio’s claim to fame is that it introduced the now nationally known taquito to San Diego. El Indio also ships their delicious homemade tortilla chips to many parts of the globe and they are also served in restaurants all over town. As the story goes, El Indio had its beginning as a tortilla factory run by Ralph Pesqueira 75 years ago and it is still operated by the Pesqueira family today. Ralph senior decided that what the small town of San Diego needed back then was a tortilla factory So he chose a nearby location and found a corn grower in La Jolla and proceeded to grind corn and make tortillas by hand. Customers from the nearby aircraft factory began to suggest that they serve more than just tortilla chips. That’s when he started making the taquito, a word he coined meaning “little taco”. Customers to El Indio Mexican Restaurant contribute the restaurant’s success to the taquito, others say it’s their delicious chips and salsa. You’ll have to be the judge when you eat here and become part of the legend. Interestingly enough, El Indio isn’t a fancy sit down restaurant, but the food is good and it’s prepared quick, so quite naturally most of its customers come here to pick it up to go. If you get here a noon expect to wait a few minutes waiting in line. But that’s part of the fun of visiting El Indio. El Indio also has a mini parking lot, which is quite helpful as parking is always at a premium. El Indio is also well known for their outstanding catering for events, weddings and backyard parties. 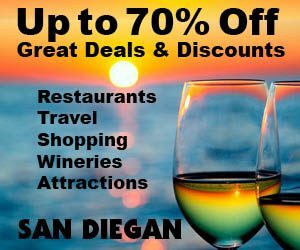 They also offer a discount coupon for 10% off that can be found in Coupon and ticket section of the SAN DIEGAN website. Next door to the south is Blue Water Seafood Market & Grill (2) at 3667 India St. (619-497-0914) is a local favorite for food to go, dining in or buying freshly caught seafood to take home and cook it yourselves. When you dine here think fresh calamari, fresh Red Snapper and freshly made chips. And just like at El Indio next door, you’ll have to wait in in line to order and they do not take reservations. But that’s the way customers like it in this fast paced environment. The owners, who are avid fishermen, who decided to cut out the middlemen and serve their catches to their customers. So expect to enjoy the freshest fish in town caught here in local waters. However, with their continued success they have had to rely on other local fishermen to supply some of the fresh fish. But it’s still fresh. Their hours are Mon. – Thu. 11:30 a.m. – 10 p.m., Fri. 11 a.m.–9 p.m. and Sat. and Sun. 11:30 a.m. – 9 p.m. Credit cards: AE, MC, VISA. Across the street to the north of El Indio is the equally famous Shakespeare Pub and Grille (3) at 3701 India St. (619-299-0230). This well established English pub is a local hangout especially when the world cup is being played. And with its authentic atmosphere it has been voted San Diego’s best English pub year after year. This has the feel of an authentic pub with half-beamed walls, the beamed ceiling, all of the real pub decor and a great selection of ales add to the atmosphere. Popular entrees are their fish and chips, bangers and mash plus all of the other typical English fare rarely found outside of England itself. Yes, you’ll feel as if you’re right in England. And since the their location is slightly elevated on a small slope you’ll get a nice view from their outdoor patio all the way out to the tip of Point Loma 10 miles away. Their English atmosphere is why this pub is also home to tons of British ex patriots who come from miles away to get their good old English soccer on the big screen TVs. Whether you dine inside or out on the sunny patio, you’re in for a nice experience. Credit cards: AE, DISC, MC, VISA. A double plus is that just across the pub’s side courtyard is a real treasure. It’s a separate business called Shakespeare’s Corner Shoppe (3) at 3719 India St. (619-683-2748). It’s owned by a former Britt that hailed from Surrey, England. Featured here is a variable treasure trove of foods and gifts from England, Scotland Ireland and Wales. So expect to find a jammed pack shop filled with everything you miss about Britain, including your favorite Jams, Teas, Biscuits, Candies, Pies, Bangers, Scones to name a few. They even have Royal Family commerative bone china, tea towels, and teapots. A tea sniffing bar filled with over 40 loose teas to choose from delights the customers who you hear ohhing and ahhing as they smell different blends. The shoppe is open weekdays 10 a.m. to 8 p.m. and 9 a.m. to 8 p.m. on the weekends. The tearoom which is actually a delightful outdoor patio with a large awning and heaters starts serving at 11a.m. and has a last sitting of at 4 p.m. during the week, weekends two sittings are available at 12.30 p.m. and 3.30 p.m. Reservations are highly recommended as they fill up quite often. Credit cards: Discover, MC. VISA. They also have their own English bakery, where they make their own Pies, Pasties, Sausage Rolls, Scotch Eggs, 12 different flavors of Proper English Scones, Treacle Tarts and much, much more. Due to the popularity of their shoppe which opened in 2000 they have opened a second location in La Mesa called “British Village Shoppe.” Both locations are a treasure trove of everything English! Selina Stockley and her staff are delightful and always willing to help with those questions only a Brit would know, so do stop by for a chat you can find them right in the heart of International Restaurant Row. 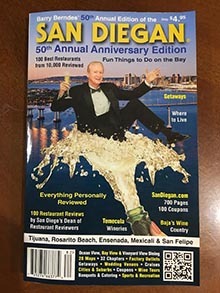 Magazine’s “Best Sandwich in San Diego Award” several years in a row. If there is a secret to why their sandwiches taste better than all the rest, it’s because they bake their own bread fresh daily. They also do catering and do deliveries for large orders. Their other locations are in North Mission Beach and in La Jolla’s Golden Triangle region of San Diego near UCSD. Credit cards: AE, DISC, MC, VISA. Under everyone’s radar is a rare find that is only known by word of month. 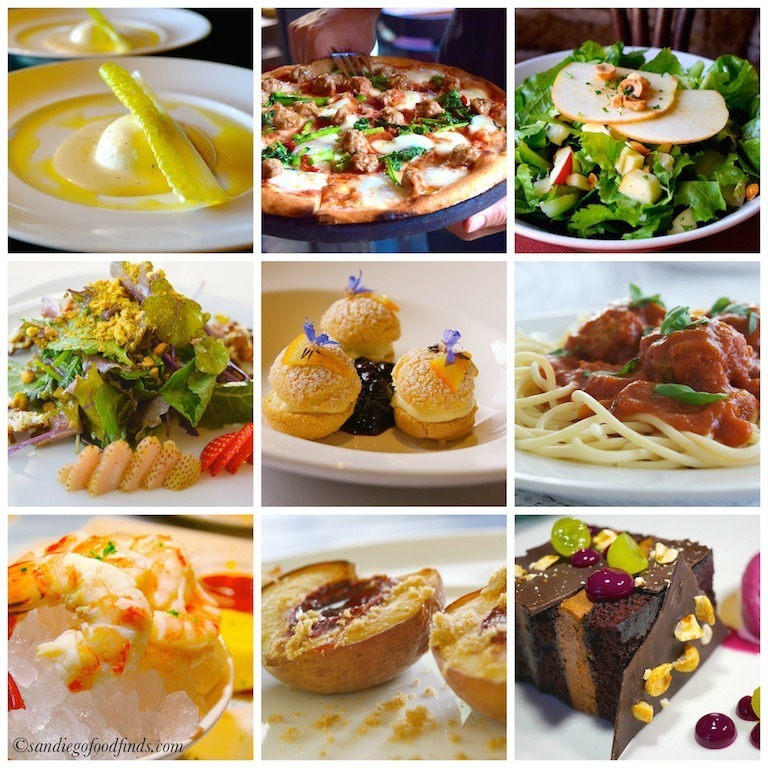 It’s the Wine Vault & Bistro (4) at 3731 India St. (619-295-3939). And a discouragement for being successful is that it can only be accessed by a flight of stairs. But despite not advertising and being up a couple flights of stairs it has succeeded. It’s enticing amenities are it’s warm fireplace, lots of delicious wines, and as many as 40 wine dinners hosted by famous wine makers featuring five to seven courses and paired with five to seven wines ($60–$80). And credit card reservations are a must. Refer to their wine tasting calendar at [winebaultbistro.com]. And the list of famous winemakers hosting these events represent the who’s who of wine making including Tobin James (Tobin James Cellars Paso Robles) and Michael Mondavi (Mondavi Family Winery, Napa Valley) to name but a few. If you love good wine and good food, you will want to enjoy an evening speaking to your favorite winemaker. Featured here are excellent coastal cuisine and excellent wines for any occasion. Plus, you can sign up for a memorable meal in the wine country itself be it a culinary adventure to the Valle de Guadalupe near Ensenada, Mexico or to the Columbia Valley in Oregon. Wine lovers should rejoice with their discovery of this off the radar discovery. Next door to the north is a restaurant which is home to exotic Thai cuisine that some same is the best in all of San Diego. It’s Saffron Restaurant (4) at 3737 India St. (619-574-7737). What began as a small take-out ONLY fast food restaurant, which has expanded into the space next door and now is a sizable sit down restaurant enjoyed by all. Many customers rave about this place! It’s easy to believe that it’s really good when you find yourself waiting line to get seated. What’s special here is that virtually every entrée from their Thai chicken, noodle dishes, salad rolls, soups and sate, which is a spicy skewered meat entrée, is excellent! The also do a big a food to go and catering business. Here too is the newest location of Karina’s Ceviches & More (619-255-5900) at 3731 India St. It’s open daily 11 a.m.–9 p.m. Karina’s serves delicious seafood delights to go. Next door is the one and only Gelato Vero Caffe (5) at 3753 India St. (619-295-92690. It’s another San Diego legend. Opened in 1984, it has been named “best ice cream” by numerous reviewers. And as you might expect their gelato is made right on the premises .What makes it so good is its creamy, smooth , dense consistency. They have 12 different fabulous flavors and can transform these into delicious shakes, malts, smoothies, freezes and floats. Gelato Vero Caffe also has a full coffee bar that includes espressos, teas and Italian sodas. Plus they offer cakes and international desserts, two sitting areas and wifi. So if you’ll looking for a place to rest your feet. This is the place. Across the busy Washington Street thoroughfare, which as a signaled street with a crosswalk, are two other discoveries. One is Palomar Market (6) at 1802 West Washington St., a local market since 1927. They carry spirits, canned goods and other last-minute items and of course they sell lotto ticket. So maybe it’ll be your lucky day. In the parking lot next door is Yoshino Japanese Restaurant (7) at 1790 West Washington St. (619-295-2232). This is an established restaurant with an authentic Japanese atmosphere, serene and well ordered with attentive servers to wait on you. They have a vast array of sushi, that that’s only one of the reasons most people diner here. Patrons especially like the tempura and teriyaki, which are mainstays of the restaurant and have thus created a loyal following. Another bonus is that this restaurant has a large parking lot, which is a rarity here, which is why there are a lot of parking meters all along India Street. Credit cards: AE, MC, VISA. Totally overlooked by most patrons of San Diego’s International Restaurant Row is the eventual size that the business owners, which comprise this dining destination see its eventual size, when you realize that it also includes The Starlite Lounge (8) at 3175 India St. (619-358-9766). This dinner and drink hideway is open 7 days a week from 5 p.m. to 1 a.m. With gourmet chefs and an emphasis on seasonally grown staples, it has made a name for itself as being a cut above the rest for its cuisine, atmosphere and libations. Don’t miss this place. With so many dining alternatives in one place The International Restaurant Row has definitely made a good name for itself. And being freeway close from almost anywhere, it’s a great destination for a food to go solution, for people on the go. So join the revolution and become an International Restaurant Row regular.